One quick note I will be doing a talk on the Appalachian Trail and the book on Friday, February 10th at 7:30PM for the Sierra College Natural History Museum Speaker Series. Amazon & Kindle – You can find both the paperback ($9.99) and ebook ($2.99) at Amazon, if you buy the paperback you get the ebook as a bonus for 99 cents if you are so inclined. Createspace – If you order through Createspace ($9.99), Amazon doubles my royalty. I’m assuming they do this to help drive traffic to the Createspace store. So if you want to help maximize my royalty this is the best way. 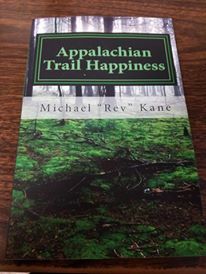 Signed Copy – If you would like a signed copy please contact me directly at happinesskane@aol.com. For these I have to order a copy from Createspace, then sign it and ship it to you directly, due to the double shipping I charge $15 for this option. What was the most beautiful thing I experienced today? The book explores the positive side of long distance hiking and makes insights to the benefit of adventure in making us happier in life.